Yes well maybe this isn't strictly a Christmas feel good movie, but I feel good watching John McClane annihilate a load of terrorists and it takes place during a Christmas party, so I reckon it counts. Plus he puts a Santa hat on a dead body and writes 'Ho Ho Ho' on his sweater. You don't get much more festive than that. You cannot have a Top 10 Christmas movie list without one adaptation of Dicken's 'A Christmas Carol' somewhere on the list. And whilst Scrooged, or the Muppet's effort may rank higher for many of you, this is my list and this film was a seminal childhood classic for me that I watched over and over again. And it works too. 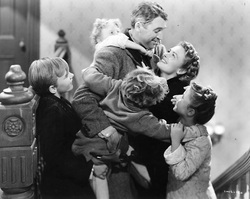 Hearing little Tiny Tim end the film saying, "And God bless us, every one" gets me every time. Ahhhhh. Just as you cannot have a Top 10 Christmas movie list without one adaptation of Dicken's 'A Christmas Carol', you cannot have a Top 10 Christmas movie list without at least one film directly addressing the reason we all celebrate Christmas in the first place. 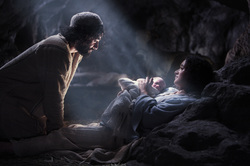 Whether you believe or not, Christ's birth is what it is all about (the name is kind of a giveaway). This retelling of the Nativity Story is as well put together as I have seen and is told in a way that both young and old can relate to. Christmas without watching this film simply isn't Christmas. On paper the script calls for people getting their faces smashed with irons, paint cans and shovels, their feet spiked by Christmas tree decorations, slipping on ice, standing on nails, their heads burnt with blow torches and all sorts of other horrifically painful episodes that make it seem like a Japanese torture film. But it's okay, they are not real people, they are camped up panto villains, so it's okay to do those things to them. And it's all in the name of family festive humour! And the end of the day, what isn't there to like about this film? Exactly. It even has a John Candy cameo! Remember when Eddie Murphy was funny? Well I do. It was back in the early 80s and he was hilarious. No more so than in this Christmas comedy caper with Dan Aykroyd. Just the thought of the much fallen Aykroyd surreptitiously stealing a whole poached salmon, slipping it under his soiled Santa's coat and then nibbling at it on the train gets me laughing. A comedy classic. Perhaps not your traditional Christmas flick, but the heady blend of humour, satire, dead bodies, banter, chopped off fingers, magic tricks, all variety of non-PC jokes, a resurrected Elvis, oh and an on form Michelle Monaghan in a Santa outfit make this neo-noir crime caper a perfect - and hilarious - Christmas movie. Although maybe not one to watch with the whole family. One of my greatest movie frustrations is that Shane Black is not more prolific. This was his first writer-director effort and I want more. This is endlessly quotable and certainly necessitates repeated viewings if just to get your head around the labyrinthine plot of double crosses and bluffs. But don't let that put you off, as you'll want to watch it again and again. Yes this is schmaltzy, but if you can't be schmaltzy at Christmas then when can you be? Old Kris Kringle - who really does look like old Santa - actually thinks HE IS Santa. Crazy huh? Well, perhaps not! As I said, a sickly sweet Christmas treat - the perfect accompaniment to all that Christmas pudding and brandy butter and brandy cream with a mince pie on top. I can't believe that it took me so long to discover this film - what a treat. The rare mix of a child's thoughts being narrated to us by a 60 year old but with childlike enthusiasm and invective is just a small part of what makes this so compelling. Essentially it is a series of anecdotes based around little Ralphie in the run up to Christmas as he sets his heart and soul on getting his coveted gift: an official Red Ryder, carbine action, two-hundred shot range model air rifle. But it is much more than that. It is full of heart, very funny and will stay with you long after the decorations have come down. Not a huge surprise I should imagine, seeing as it wasn't placed in 10 through 2, but a deserving winner. Not without reason, director Frank Capra had much of his work labelled Capracorn due to its extremely high doses of saccharin, but old Jimmie Stewart gets away with it here. And them some. Perhaps it is his down-to-earth earnestness, perhaps it's that his kids are so darn likeable, perhaps it's the bumbling old angel, or perhaps it is just that at Christmas - more so than any other time of the year - everybody wants to believe in the innate goodness of people and experience a little hope in a world that often seems to have forgotten it. So there you have it, my festive Top 10. Sure there are plenty of other decent options, and I am sure some of you can't quite get your head around some of these inclusions, but hey, it is a forgiving time the year, so be nice.